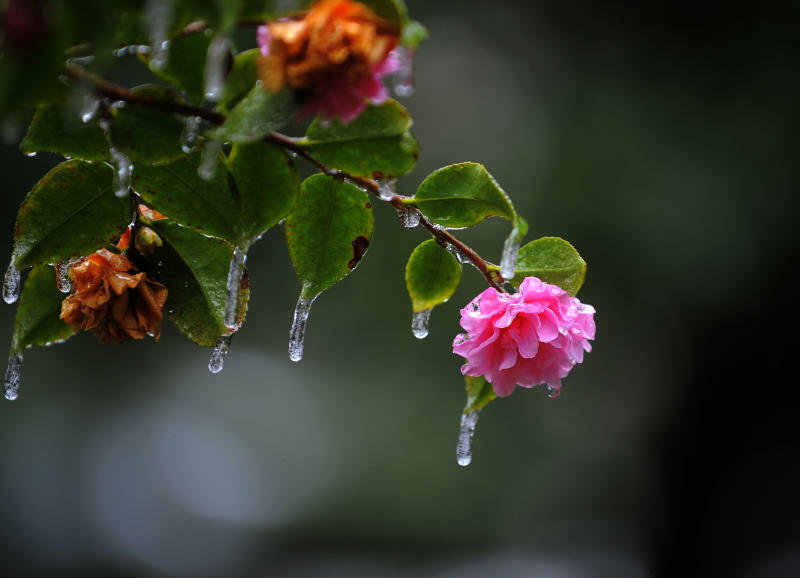 ATLANTA (Reuters) - A rare ice storm turned Atlanta into a slippery mess on Wednesday, stranding thousands for hours on frozen roadways and raising questions about how city leaders prepared for and handled the cold snap that slammed the U.S. South. The storm, which has killed at least seven people, on Tuesday swept over a region of about 60 million largely unaccustomed to ice and snow - stretching from Texas through Georgia and into the Carolinas - and forecasts called for more freezing weather on Thursday. Atlanta Mayor Kasim Reed came under fire for his response to a storm that trapped hundreds of children in schools overnight, some without provisions, and created traffic jams stretching for miles on roads coated with two inches of snow. "Folks are angry with the mayor of Atlanta, with the governor," said Flavia DiCesare, 54, who spent the night in her office at Cox Enterprises in Atlanta, about 30 miles from home. The mayor said schools, businesses and government offices were partly to blame for sending all the workers home just as the storm was rolling in. "During the day, we have a million to 1.2 million people in this city and all those people were out in very bad weather. It hampered our ability to get our equipment on the ground and to prepare our roads for that," Reed told a news conference. "The error - and we have shared responsibility for the error - the error was letting everybody out at once," he said. Georgia Governor Nathan Deal said all of Atlanta's school children had been safely returned to their families by Wednesday evening, with help from the National Guard and State Patrol. The one-day snowfall of 2.6 inches ranked as the 20th heaviest in Atlanta, which has recorded a daily snowfall of an inch or more 55 times since 1928, according to the National Weather Service. The city's highways became parking lots and thousands of motorists, still stuck 24 hours after the storm hit, were seeking help and food. Workers who couldn't get home were setting up makeshift accommodations in stores and offices. The roads, littered with stranded cars, looked like a scene from the television show "Walking Dead", said DiCesare, who spent the night in her office with about 100 other employees. "It looks like zombies walking on the side of these roads," she said. About 800 traffic accidents were reported in the city, but there were no serious injuries, officials said. At least five deaths in Alabama and two in Georgia were blamed on the weather. Latasha Wade, 38, said she was awaiting word of her 31-year-old brother, last heard from Tuesday night after his car was stranded in Atlanta. "I don't know if he's laying out in the snow or what," she said. "It's the most hurtful thing because I don't know anything that's going on with my brother." The storm took a toll on air travel across the region, with more than 2,600 U.S. flights canceled and hundreds of others delayed, according to flight tracking website FlightAware.com. In southern Louisiana, the ice and cold were the worst the region has seen in a decade. Near New Orleans, sections of major roadways were closed, including the 24-mile Causeway Bridge spanning Lake Pontchartrain, and nearly a full day of flights were canceled at Louis Armstrong New Orleans International Airport. Across the South, authorities appeared caught off guard by Tuesday's storm, and were left to cope with its aftermath on Wednesday. 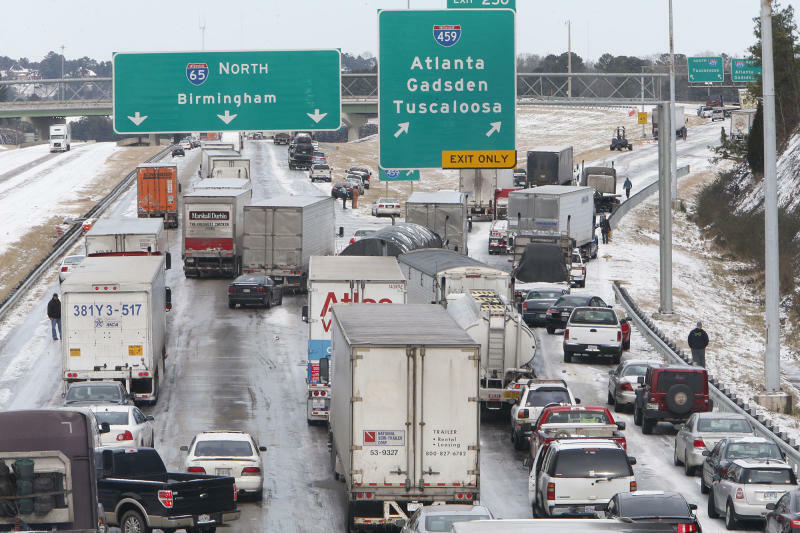 In Birmingham, Alabama, authorities said a lack of warning about the treacherous conditions led to thousands being stuck on roads, in shelters and in schools on Tuesday night. Snow-clearing vehicles were initially directed south of the city, where the icy conditions were expected to hit. "We proceeded to have school and have people go to their jobs," Mayor William Bell said. "When it came, it was too late." About 800 students were stranded overnight in Birmingham schools. Forecasters predicted little relief to the unusual cold blast, with temperatures due to dip below freezing again across the Southeast early on Thursday. That could hinder efforts to clear ice-covered roads across the region. Nicole Lynch, 22, a student at Kennesaw State University, was among the Atlanta motorists who found themselves stuck in frustrating traffic snarls. "They should have at least warned any sort of road crew, or taken some precautions. They should have canceled school a lot sooner than they did," Lynch said. "It's a lot of shudda, cudda, wuddas." 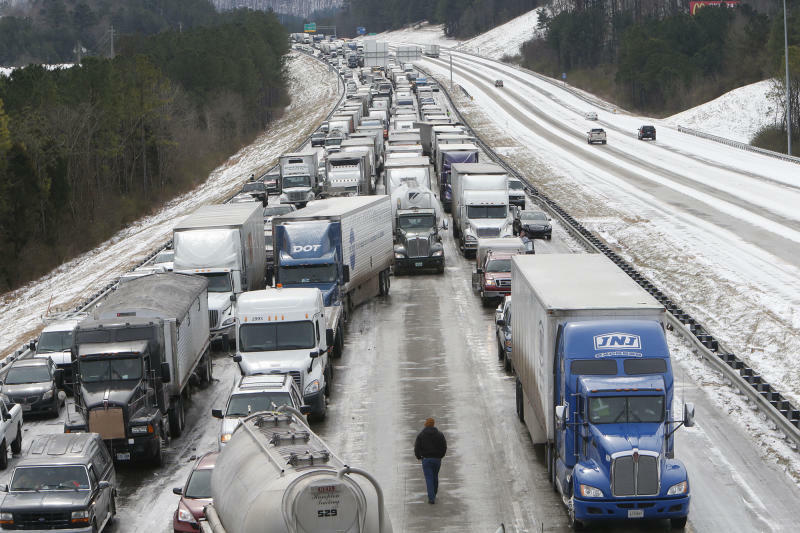 A Facebook page called "Stranded Motorists Help Jan 28, 2014" which has more than 10,000 members, amassed entries from frustrated drivers and volunteers trying to come to their aid after the daylong gridlock in the Atlanta metro area. Rachel Richter, 30, said she finally abandoned her car, after sitting in a traffic jam for six hours. "It was more the frustration that it was just complete gridlock. Nothing was moving at all," she said. "You moved like an inch in two hours."